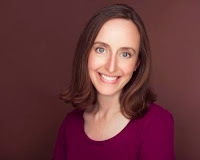 Passages to the Past is pleased to host author Iris Anthony today with a guest post in honor of the release of her novel THE RUINS OF LACE, which hits stores today! Sourcebooks has also generously offered up a copy to give away to one of my lovely readers! Welcome, Iris and Happy Release Day! Thank you so much for hosting me today! I love your site and I’m thrilled that the first stop on my blog tour is with you. I’ve always been fascinated with history and I think much of the credit (or blame!) falls to my mother. She had a huge cedar chest in her bedroom. From time to time we would beg her to open it and tell the stories of the things inside. An archeologist’s dream, it was composed of definite layers. At the top was the shirt I refused to take off for who knows how long when I was two years old; the layette my sister wore when she came home from the hospital. I was never much interested in that layer of things or the one beneath it: a pair of lavender silk pajamas from Vietnam, a psychedelic-patterned dress, a long cowrie shell necklace that clicked when we pulled it from the chest, but caught and pulled at our hair whenever we attempted to put it on. The third layer was better with its Campfire Girls uniform complete with moccasins so old the leather had aged to a shine. A musty-smelling teddy bear with green glass beads for eyes, an arm that dangled by a literal thread, and vast patches where its velvet fur had been rubbed off. There was a doll from Holland with a tiny lace cap and wooden shoes, and another from Switzerland. She was a goatherd with blond colored pigtails and a pair of felt shoes that kept slipping off their wire frames. Next came the tie my grandfather wore and the pendant that hung from my grandmother’s neck when they married. A pair of opera glasses inlaid with mother-of-pearl. A scrapbook of my grandmother’s which showed her hamming it up in the 1920s with her high school friends. There was a bundle of her painting brushes along with the penknife she used to whittle a point on her charcoal pencils. And nestled away between them all, a lavender wand woven with faded purple ribbon that bestowed a fine, scented, powdery dust when it was shaken. Beneath that was a whole slew of oddities from a nineteenth century New England ancestor’s sea-faring days: mate tea from the wilds of Argentina and a gourd to drink it in; a shiny rhinoceros horn; a nearly petrified Brazil nut fruit with the seeds still rattling around inside; a beaded cane that was rumored to have belonged to an African price; a pair of raised wooden sandals used for walking the sands of the Sahara. But my favorite layer was tucked away at the bottom of the chest and wrapped up in pillowcases and tissue paper. That layer contained the lace. A pair of fingerless gloves. A doily with satin-stitched pansies ringing its border, the flowers so delicately shaded I could hardly tell when one color left off and another began. A baby’s cap decorated with frills of embroidered cutwork. Lace-edged petticoats and lace-collared babies’ gowns. And shawls--such shawls! Of value in and of themselves, the most important legacy those favorite objects have given me are questions: who and why and how. Who used all those things? Why were they in the chest and how were they connected to me? Decades later, when I ran across a mention of lace smuggling, it provided an opportunity to bring meaning to the mysteries of my childhood. To put a who and a why and how to all that lovely lace. The answers I discovered through research, like the contents of the chest, were unexpected. They were both very much more and so much less than I ever could have imagined. My passage to the past began by lifting the lid of an old cedar chest. My hope as a writer has always been that I can lift that lid high enough and keep it open long enough so you, too, can experience all the wonder and fascination with eras gone by that I have. Lace is a thing like hope. It is beauty; it is grace. It was never meant to destroy so many lives. Iris Anthony is a pseudonym. The writer behind the name is an award winning author of 11 novels. Disguised as her alter-ego, Iris has lived on three continents and traveled to five. She has given up on keeping a diary, buying a château, and liking tea. She stills hopes one day to be able to knit a sweater, play golf on the Old Course, and visit Antarctica. Iris lives in the Washington, DC Metro area in a house decorated with French antiques and Flemish lace. Learn more about Iris at http://irisanthony.com. - Giveaway ends on October 13th. A big thank you to Iris Anthony for a great guest post and to Sourcebooks for sponsoring the giveaway. Good luck to all! The Ruins Of Lace sure has my attention and interest. Congratulations on the release! The Ruins of Lace sounds fascinating! This sounds like a great book, and I love the cover. Thanks for the giveaway. Oooo - this sounds delicious! Please put me in for the giveaway! What a great novel you have written here. Lace is so beautiful and many years ago, the work that went into making it, is truly mind-boddling. When I lived in Paris, I loved to visit Brussels and meander around the lace shops. Of course, I had to buy some and I just treasure it. I did not realize that it caused so many problems in years past. 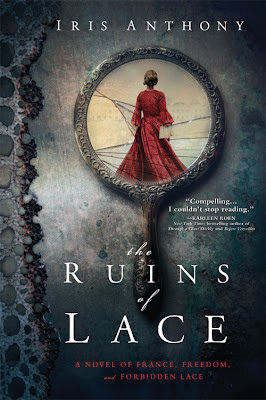 My interest is truly peaked here and I'm certainly looking forward to reading "The Ruins of Lace." It's an intriguing subject. Thanks so much for sharing your family treasures and the synopsis of your new novel. Congratulations on its release! This book looks very intriguing! Thank you for hosting this giveaway, my daughter will love this book. Really looking forward to reading this one! I have been intrigued by it since I first heard about it. I have always wanted to try making lace. I tried to post and it didn't take so I lost everything! Starting again!!! It is terrible to forbid lace. I remember my grandmother making it and still get some of it out to enjoy. I am giving it one more try!!! I saw this title advertised while searching on Goodreads. It's on my to read list. It's sounds so intriguing. Thank you. I've heard great things about this novel. I had never heard of lace smuggling before but then again I love that history is chalk full of odd stuff like this. Thanks for the chance to win! Thanks, Amy for hosting me and thanks to everyone for your interest in my novel! Crossing my fingers for all of you. What a great look at the historical significance of this fabric. Not an unknown area but certainly one that I could know more about. Thanks for the giveaway. I follow PTTP at the above email address. This sounds great! Please enter me in the giveaway. I am a follower. Thank you! This sounds like a great read! Please enter me in the giveaway. I am a follower. Thank you! I am just giddy with excitement! At first, I thought a beloved author was being feature on PTTP, but now realize that it is another name. I still think it is the beloved author, but my lips are sealed. I would love to win a copy, but am thrilled just to learn about this novel. I'm already a member of the FB page. I shared on my FB timeline (Beth Bulow). I shared on my twitter (bbulow12). Interesting premise for a story; never read a novel about lace before! I am looking forward to reading this book. Please put my name in for the giveaway. Thanks so much for sharing this and other wonderful new books! That is a beautiful way to look at cloth. I'm also fascinated with its many layers and I feel the same about history. There is so much to learn beneath the layers. I would love to read your book. Would love to read this story. Thanks for the giveaway. I'm a follower. Sounds like a great book. jtretin at aol dot com. I follow on Twitter (@readsalways) and FB. This looks like a great book. Thanks for the opportunity to win. I did or am subscribed to all of the above. I just saw the book on Shelf Awareness and would LOVE to read it. I'd love to read this book. Thanks for the giveaway! Already follow on Twitter, too! Nice post. The book sounds fascinating.